3 Bedroom multi level, 3rd floor rear with balcony and deck. Master bedroom with King bed, ceiling fan, 32" flat screen TV, full bath and walk-in closet. Guest bedroom offers King bed, ceiling fan, 32" flat screen TV, full bath and walk-in closet. Upstairs open area features 4 Twin beds, Queen bed, 48" flat screen TV/DVD with couch sitting area, closet, full bath, A/C, ceiling fan and deck. Fully applianced and utensiled kitchen with breakfast bar and 3 stools; dining area with table and 6 chairs. 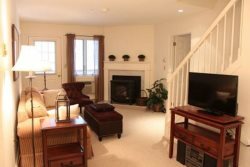 Living room area offers A/C, 40" flat screen TV/DVD, gas log fireplace, and balcony.